METAL PLATING POLISH A(Rough) 80ml Free Sample First time only max. 1 pcs. Get stains out of chrome plating easily. Save time and effort with this easy-to-use item. 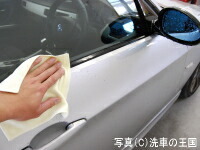 "PLATING POLISH" is the polishing compound for removing stains and spots on plating parts. It is very effective for removing dullness on plating parts or water spots on black chrome plating window frame of the cars. Do not be worried if you use this "PLATING POLISH". The stains can be removed easily with no scratch. "Cannot remove with anything so far"
"Don't know well how to remove water spots on plating part." "Give up for dullness on plating part." 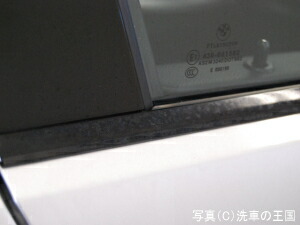 The dullness of plating part or the water spots on black chrome plating window frame can be cleaned out in short time. ■Example 1. "The dullness of plating parts cannot be removed "
The plating parts can become dull when time passes. When plating keeps shine, it will look like mirror. Put "PLATING POLISH" on the attached sponge and rub the dull area vertically and horizontally. ■Example 2. 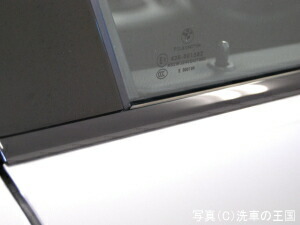 "Black chrome plating is also OK！"
This is black chrome plating window frame of European car. Water spots on black chrome plating are very remarkable. If you leave them for a long time, the spots and dullness become difficult to be removed. 1.Wash wheel and rinse out thoroughly. 2. 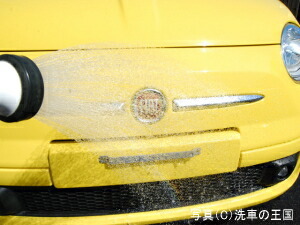 Wash out with car shampoo such as "BODY CLEAN". 3. Wipe off the remaining water. 4.Put "Liquid A" on Felt Sponge and rub vertically and horizontally with care. 5. 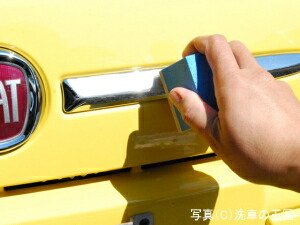 After the dullness or spots are removed, put "Liquid B" on another sponge and wipe down on the plating part. 6. 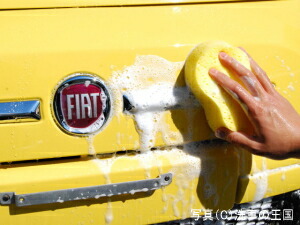 Wash with car shampoo such as "BODY CLEAN" and wipe off the remaining water with a clean cloth. If you use the product without removing dust, it might cause scratch. Please be careful. 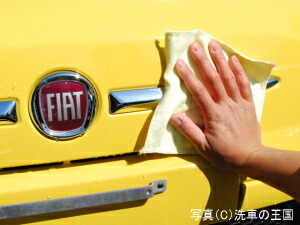 We prepare "PLATING POLISH" with the liquid 2 types. Polish with "Liquid A" and finish work with "Liquid B". When the time passes, the dullness of black chrome plating becomes severe. 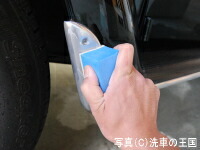 "PLATING POLISH" can create a good effect when using with "FELT SPONGE". 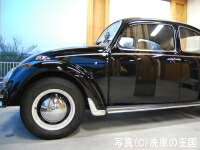 Restore plaing condition with "Liquid A" and make shine finish like mirror with "Liquid B". This product is the polishing compound for plating. Let the liquid penetrate throughoutly Felt Sponge before using. The plating condition is restored by polishing vertically and horizontally with care. Some plating conditions might not be able to be improved. 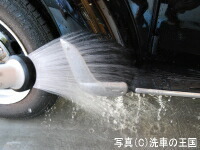 【2】 Wash out with car shampoo such as "BODY CLEAN". 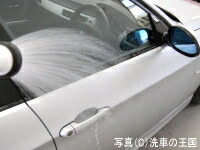 【3】 Wipe off the remaining water. 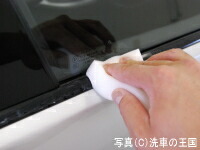 【4】 Put "Liquid A" on Felt Sponge and rub vertically and horizontally with care. 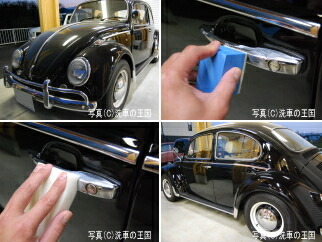 【5】 After the dullness or spots are removed, put "Liquid B" on another sponge and wipe down on the plating part. 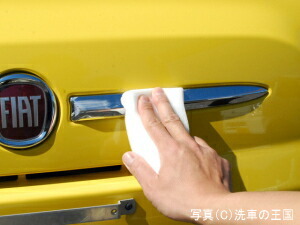 【6】 Wash with car shampoo such as "BODY CLEAN" and wipe off the remaining water with a clean cloth.